A versatile swivel fitting, useful for awkward applications where angles cannot be accomodated by adjustable angle fittings. The assembly is riveted together, although items can be supplied seperatly as 167M and 173F. 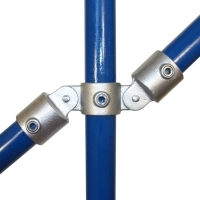 The through tube (vertical in picture) cannot be joined within the fitting.